Americans have been through all the stages of joy and grief when it comes to mortgages over the last few years. First low rates for everyone, easy approvals for most, big debts for many, underwater property values for some and most recently low rates for the precious few that can still qualify for a mortgages, and now sketchy credit once more. If only Latin Americans had it so easy. Unlike their neighbors to the north, most Latin Americans don’t have the luxury of participating in the mortgage market even if they wanted to, and this in my opinion is a really bad thing. Anyone who has knowledge of housing markets in Latin America knows how shallow the mortgage market is, but most people don’t understand the dynamics pushing on this issue. 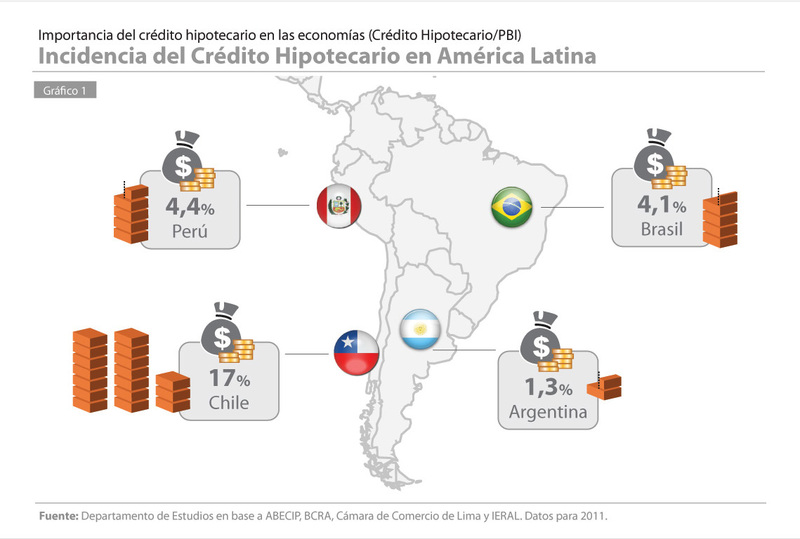 Not unlike what is happening now in the U.S. with tightening credit risk standards despite low rates, it’s only the very wealthy in much of Latin America that qualify for private mortgage credit. Those who don’t have significant liquid assets are just too big a risk to take without external (government) guarantee. That’s before even trying to evict somebody, a Sisyphean task most anywhere in the region. There are some actors trying to fill the gaps, but it’s not enough. One of those I met last week at a fantastic event at the Council of the Americas. It was there that Nicolás Berardi, the wunderkind of Techo (Un Techo Para Mi País) gave an overview of the effective and worthwhile building and advocacy work the organization does across Latin America to assure dignified housing conditions for vulnerable groups. But after learning more about the group’s plans to scale up, the first thing to come into my mind was mortgages, and why a more stable mortgage market has to be the solution to many of the housing problems particularly rampant in the regions big cities. A healthy mortgage market, with proper government support and backing could, in my mind, break the vicious cycle that plagues Latin American communities that rotate between informal housing, NGO-sponsored dwellings, and government housing that isn’t available for all and often doesn’t materialize. Maybe its my inner Republican talking, but I thought there must be a market solution for a problem that government isn’t solving. Right after the event, I stumbled upon a piece in Uruguay’s El País newspaper (as one does) lamenting the country’s average property values as the highest in Latin America when I came across this revealing chart. What strikes you first about these statistics, taken from the national housing agency? 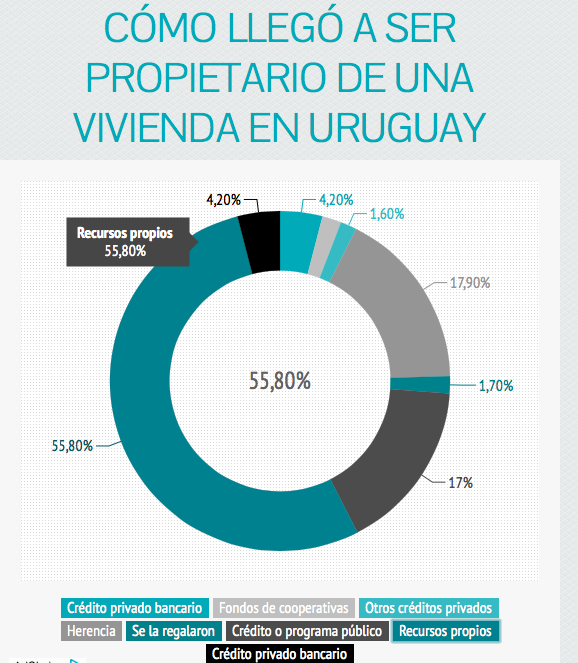 The question posed is: “How did a homeowner in Uruguay come to own their property?” Discounting the small error that one factor (private bank credit) is listed twice, think about the fact that 55.8% of Uruguayans buy their properties with “recourses propios” or “their own means” or more simply “cash”. Then add the fact that 17.9% of all owners inherited their property (and the even more curious 1.7% that “se la regalaron” or someone gave it to them) and you have a whopping 76% of the population outside of any sort of financing for their housing. And this is in one of Latin America’s most advanced, prosperous and stable countries! Its big brother Argentina fares even worse, and the 2001 default that brought the country to its knees also effectively eliminated much of the private credit market. If the government’s not a trustworthy borrower, how can you lend to anyone else? Another chart I dug up in my research shows how low penetration rates remain across the region, with clear leadership on the part of boring old Chile. Mexico also has a relatively large mortgage market, although this Standard and Poors report from 2011 explains how the private market is still eclipsed by government-backed programs (it hasn’t changed much in the last two years). A report from Grupo Edisur, a local housing developer shows how far the market has to go to reach anything resembling a functioning, democratic mortgage market in four Latin American countries. Then there’s Brazil, which has stood out from the pack due to double-digit growth numbers in mortgages over the past several years. But when you start from such a low base, and have unseen levels of housing speculation, it’s tough not to grow that number quickly while also doubting how much of the figure is composed of the upper end of the market. As you can imagine, there’s so much more detail to cover on this topic, and far more than I’d like to write and you’d like to read at the moment. But suffice to say, I’m curious to do more digging into respective mortgage markets in different countries across the region and would like to continue to think about ways the region can promote growth and equality through fairer housing markets.